The Compton Scattering Experiment involves the fundamental understanding of the interaction of radiation with matter. It involves an understanding of the photoelectric effect, the Compton Effect, and Pair Production. It also involves an understanding of x-rays and radiation decay schemes. The understanding of the interaction of radiation with matter is also necessary for the understanding of how radiation interacts with detectors and is therefore measured. The processes that are being studied are the same processes taking place in the detector. Very important aspects of the Compton Scattering Experiment are that it involves the relativistic treatment of the scattering process and that the theory and analysis yields the rest energy of the electron. Figure 1: The Compton Scattering apparatus for the scattering of Cs-137, 661.6 keV gammas. Related to the Compton Scattering Experiment with gammas, an experiment on x-ray scattering and the Compton Effect using x-rays is being offered. The diffraction of x-rays from single crystals is an important scattering process. The different orientations of crystals within a powder sample are studied using a diffraction technique. Diffraction planes of crystalline materials are identified in the spectra of powder samples by assigning the Miller indices to the scattering planes. This experiment uses the Leybold Didactic X-ray diffraction apparatus and with the addition of an x-ray energy analyzer, it will also be used to study Compton Scattering of x-rays. Figure 2: The Leybold Didactic x-ray diffraction apparatus, which can be configured for x-ray powder diffraction or x-ray Compton scattering. This experiment is important as an entry point for studying the interaction of radiation with matter and learning about radiation detectors, energy analysis, and relativistic measurements. It is important for the understanding of basic radiation measurements and sources of background radiation in nuclear physics experiments. Condensed matter physics is presently a dominant area in physics research and a fundamental understanding of crystals and x-ray diffraction is necessary for pursuing research in this field. Skills that will be acquired in performing experiments are: (1) calibration and use of a multichannel analyzer, (2) use of an apparatus to measure the Compton Scattering of gamma rays from a cesium-137 source, (3) analysis of results to determine the rest mass of the electron, (4) operation of an x-ray diffraction apparatus for measuring x-ray diffraction and Compton Scattering of x-rays, (5) learn a procedure for assigning Miller indices for crystal planes for a powder diffraction pattern. During the three-day workshop, scattering spectra and background spectra will be measured at various scattering angles in order to verify the Compton Scattering theory. Since these measurements are mostly automated, other radiation detector and analysis techniques will be studied, for example the use of a germanium detector for higher resolution measurements. The use of the LD x-ray diffraction apparatus will be used to measure single crystal diffraction for sample of LiF and NaCl. A powder diffraction spectrum will be measured for LiF and the process for assigning the Miller indices to spectrum peaks will be demonstrated. Additional samples may be used if there is enough time. The apparatus will then be converted to a Compton Scattering Experiment so that Compton Scattering of x-rays may measured and studied. In all cases, the theory and background information will be presented to support the measurements and analysis of results. No additional equipment is required, but participants may wish to bring paper to record their notes and a computer/tablet/phone to look up reference material. Radiation Safety considerations will be handled by the University of Tennessee’s Radiation Safety Department. Radiation exposures from both the cesium-137 source and the x-ray diffraction apparatus have been found to be very low, sufficiently so as to not require badging of the participants. The exposures from both sources are monitored and recorded at all times. The Compton Scattering apparatus was built by the University of Tennessee Department of Physics’ machine shop. Drawings and information for duplicating the apparatus will be made available. The 30 mC cesium-137 source was purchased 10 years ago for $955.00. The cost of the multichannel analyzer, detector, and shielding is approximately $4k. 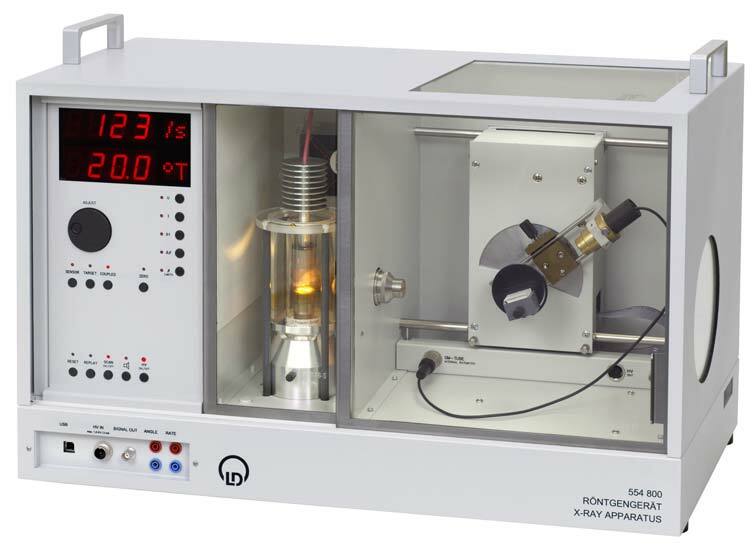 The LD x-ray apparatus with the energy analysis detector is about $30k or less.